What determines a program’s odds of success? When it comes to successfully implementing ERP, few executives understand that question like Valerie Lyons. As executive vice president of the Enterprise Solutions and Services business group for the multinational professional services and solutions company CACI, Lyons’ depth of expertise and focus on ERP systems helps to determine a project’s long-term viability. That focus takes center stage across four segment areas, within CACI’s business systems market, which Lyons oversees: financial management, human capital, supply chain, and acquisition management systems. “ERP is not for the faint-hearted,” notes Lyons, whose federal contracting career stretches back three decades, to a time when issues such as government procurement processes were already being hotly debated, making the need for consistent communication with government partners amply clear even then. Those early lessons guide Lyons to this day, in her work with a customer base that spans federal agencies such as the Defense Department, as well as civilian and intelligence community sectors. Regardless of the solution being tapped, Lyons sees a common thread for program success. Simply put, while technology is critical, it is only part of the equation en route to the ultimate goals: improving performance and enabling change. To reach customer objectives, communication must occur upfront with a clear understanding of what ultimately drives program success. “Whether it’s good, bad, or ugly, you have better outcomes when you have clear — and frequent — communication with stakeholders,” Lyons declares. Understanding client intent also requires a rigorous validation process at the outset. That is what Lyons believes distinguishes CACI in the marketplace. “It is that knowledge and insight — that intimacy with a customer’s mission — that helps reduce risk in complex systems implementation,” she adds. Shepherding a successful validation process requires another seemingly obvious, yet often elusive, ingredient: having solid program managers in place. “‘Does the client have the methodologies in place to implement programs?’ ‘Do they understand those dynamics and dimensions that really cause a program to fail?’ — those are important questions to focus on,” Lyons says. That focus has spelled significant gains for CACI in recent years, as it continues its 55-year evolution in the federal contracting industry, with nearly 19,000 employees worldwide, helping to bring solutions to government customers across sectors including defense, homeland security, intelligence and health care. Among the company’s distinctions: CACI currently leads the largest PeopleSoft deployment in the world, courtesy of its oversight of the U.S. Army’s Integrated Personal and Pay System. The company’s competitive advantage is also boosted by its domain expertise, a hierarchical modeling tool known as SIMPROCESS, as well as the software solution delivery capability Model-Driven Design and Implementation; and a hybrid agile software development process. The company’s credibility in the marketplace continues to grow through other benchmarks as well. Recently, CACI scored high marks from an independent audit, conducted at the behest of the DOD Inspector General to review results of CACI’s deployment of a full lifecycle support for the Defense Agencies Initiative solution, an Oracle EBS financial management solution currently used by more than 40,000 DOD employees, across more than 22 agencies. The audit’s findings resulted in an Unmodified (Clean) Opinion for the DAI program and solution. Such votes of confidence by government customers have Lyons reflective of next steps. Especially when it comes to areas such as shared services, whose need will only continue to grow. “There is room for continuing to promote shared services, in this case [DAI] internally,” Lyons says, noting another five agencies are in the pipeline to migrate to one platform. Communication, once again, underpins Lyons’ approach. So does asking the essential questions, which, she says, include: What is the agency’s governance structure? What does its infrastructure look like? What does its security look like? Does it have the competencies to deliver on a shared services model? That’s where vendors like CACI can help, Lyons adds. “Any time government can leverage an investment that someone else has made, I think that can benefit agencies, on the government side,” she says. 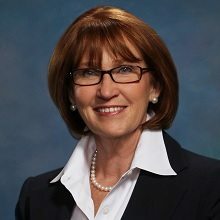 Throughout a complex ERP implementation, Lyons intends to help government customers avoid the common pitfalls she’s seen so often — notably, when business process systems fall to the bottom of budgeting priorities just as “mission” stays ineffectually on top, without proper guidance on next steps for implementation. Connecting the dots goes — and enabling change — all goes back to the communication Lyons is so passionate about promoting. That focus, with results achieved — and conveyed — to government customers, guides Lyons through the next chapter in the evolution of shared services.